On the eastern side of Cape Cod, just north of Truro, off South Highland Road from Route 6. The Highland House Museum is also on the premises, and you can take a tour into the lighthouse tower. Highland Light was built in 1797 about 500 feet from the edge of a 160 foot bluff, about a mile from where many ships previously were wrecked on an area called Peaked Hill Bars. The original tower contained 24 whale-oil lamps. Not to be confused with Boston Light, it became the first lighthouse in the nation to have a flashing light. The light was somewhat erratic in its timing and was replaced in 1812 with a new system of 15 lamps and reflectors. The worst wreck recorded at Highland occurred in 1849, when the British vessel, Josephus sank in a violent storm, 14 crew members perished. Keeper Hamilton and a companion found two men washed ashore from the wreck barely alive and helped them regain their strength at the lighthouse. One of the crew members, John Jasper, became a captain of an ocean liner and would always dip the flag as a signal of respect every time he passed he lighthouse. A high volume of vessels would pass by the lighthouse, which needed to be logged in daily, as one of the many duties of a lighthouse Keeper. Keeper Hamilton counted over 1,200 vessels passing his station during an 11-day period in 1853. To accommodate the high volume of traffic, by 1857, a first order Fresnel lens was installed, the strongest and most powerful type of lens. The lens stood 12 feet high, had a diameter of 9 feet, weighed 2000 pounds, and floated on a bed of mercury. One oil lamp burning inside this huge crystal could reach the horizon, 25 miles away. An even larger lens was installed in 1901. When Highland Light was converted to electricity in 1932, it became known as one of the brightest lights in America, reportedly visible for 75 miles in clear weather. In the early 1900’s, the Navy at the lighthouse site conducted experiments with wireless communications and radio beacons. 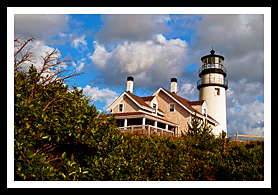 In 1976, the name of the lighthouse was switched from Highland Light to the current name of Cape Cod Light, although many still refer to it as Highland Light. In 1797 Highland Light was built 510 feet from the edge of the Truro Bluffs at about 160 feet above the sea. One hundred years later, the lighthouse stood about 300 feet away from the edge, and in 1990, Cape Cod Light was less than 125 feet from toppling over the edge of the bluff. Over 40 feet were lost to one winter storm alone in 1990. The severity of erosion of the bluff forced a plan to move the lighthouse. The 400-ton Cape Cod Light was successfully moved on steel tracks lubricated with Ivory soap during the summer of 1996 about 450 feet back from its original location. Truro is a small town summer vacation community near the end of Cape Cod with bike paths, nature trails, and ten public beaches. Visit the Truro Center for the Arts in Castle Hill. The grounds of Cape Cod Lighthouse are open year round, and occasional tours in the lighthouse are offered during the summer months. The lighthouse also is part of the Highland House Museum for visitors to enjoy. Cape Cod’s oldest golf course, the Highland Links Golf Course is located at the lighthouse to provide some magnificent views for golfers. In North Truro visitors can enjoy the Payomet Performing Arts in music, theater, film, and a kids summer stage events. Classes are taken in all kinds of performing arts here. In North Truro, visitors will find the Adventure Bound Camping Resort, or what is commonly referred as the North Truro Camping Area. 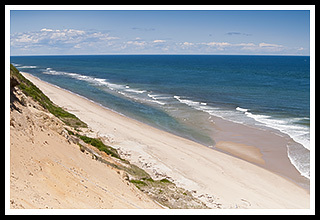 The Cape Cod National Seashore provides plenty of hiking and biking trails with almost 30 miles of beach areas, which are protected. Guided tours are also provided with Rangers during the summer season. In Truro, visitors can stop and enjoy wine tasting at the Truro Vineyards. Just a short drive you’ll find the city of Provincetown with its galleries, museums, outdoor activities and nightlife. Wellfleet Bay Wildlife Sanctuary has over 750 acres of marshes, coastal dunes, and a cedar swamp filled with nature trails. There are nature tours and exhibits available for visitors year-round. Follow Route 6 until about three and a half miles north of Truro, take the Cape Cod Light/Highland Road exit and travel east on Highland Road to South Highland Road. 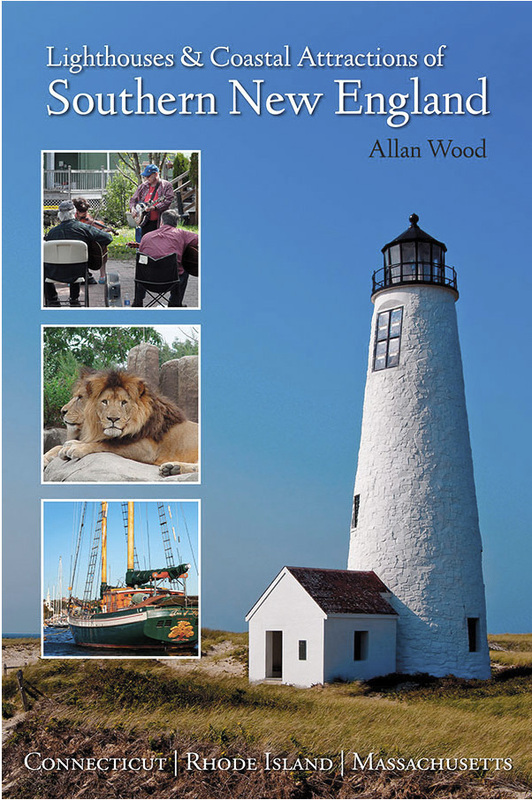 In the book you'll find local stories from all lighthouses in the Cape Cod region. At Cape Cod Lighthouse, you'll find a story about a "double miracle" at the cost of two local rescuer's lives.